It has finally arrived! Race week for the Ascension Seton Austin Marathon presented by Under Armour’s is here! We know you’re just as excited as we are for our 28th anniversary. With all the excitement it’s easy to forget the simple things you need to do race week. We’re here to help with these race-week reminders. This is one Shakeout Run you don’t want to miss! Kick off Austin Marathon weekend on Friday morning (Feb. 15th) with hundreds of your running friends, UA HOVR shoe demos, a jog around Town Lake, tacos, and coffee. All distances and paces are welcome. Fact – running is best enjoyed with friends! They can run with you, cheer for you at various points along the course, or celebrate with you at the finish line festival. If your friends have been on the registration fence, now is the time. Tell them about the upcoming price increase on Thursday, Feb. 14th, or gift them a registration yourself! If you have friends and family who cannot watch you run the streets of Austin on Feb. 17th, have them tune in to the FREE FloTrack livestream! FloTrack will cover all the action between the elite males and females racing the half marathon and marathon. Once elites cross the finish, FloTrack will capture every finisher as they cross their finish line! KXAN will provide FloTrack’s coverage to the local Austin market. Begin hydrating during race week. It’ll help ensure your body has the fluids needed to secure that next PR! Make sure you’re getting a nice balance of electrolytes and fluids during the week. You’ve put in the training miles, now make sure all systems are ready for race day! BONUS – hydrate with the Mango Orange nuun performance, it’s what’ll be on course at all 22 aid stations. There will be 2 Gatorade Endurance Fuel Zones at Miles 9.5 and 20. providing runners with Endurance Gels and Chews. There aren’t many runners who don’t already do this, but nevertheless, it’s a great reminder. Layout everything you’ll need the night before and double-check it. This increases the likelihood that you forget nothing race morning. You should even plan what you’ll eat the morning of and the night before. Stick with what works! Driving to the expo on Friday or Saturday? Parking downtown race morning? Check out all the parking options or reserve your parking spot with Spot Hero! Don’t do it on race day! As simple as it seems. If you didn’t run with it, eat it, or drink it during training, don’t do it on race day! Last but definitely not least, recoverate (recover + celebrate)! Once you cross the finish line, snag your commemorative belt buckle finisher medal and head to the finish line festival. Grab your snack bag and some hydration. Then check out the food trucks, music, and the Oskar Blues Austin beer garden! Tito’s Handmade Vodka will serve delicious mixed drinks in the beer garden as well. BONUS – family or friends who cheered or tracked you via the app can meet you and help celebrate. Did you pre-purchase your post-race massage with Austin Massage Company? Good call! If you didn’t, there’s still time to purchase a quick massage before continuing your celebration. If you didn’t get enough live music on course, you can rock out with Austin’s own Delivery Service at the finish line festival. After their two sets, Fusion will keep the party going when they cover all the hits! The Taper. For those unfamiliar, tapering is referring to the reduced volume and intensity of workouts in the weeks leading up to race day. While some runners find it hard to scale back after so much time dedicated to training, others find themselves glued to their favorite couch. Doing too little or too much during this time period can compromise all your hard work. Stick to your training plan and focus on what’s in your control. Make sure you are at the top of your game by following these 7 taper tips between now and race day. While it might be out of our hands, setting yourself up with an easy week or two of work can have a big impact on your energy going into race day. If there is a project that needs to be completed, put in the extra effort now to finish it or see if it can be completed after race day. Try building this into your schedule: find a quiet place to meditate for 10-15 minutes in the morning or evening. We’re clearly stating the obvious, but now is not the best time to roll your ankle playing basketball or pull a muscle lifting heavy weights. Stick to what you know and focus on less-intense and lower-volume workouts. Keep your runs to less than 60 minutes, but leave room for flexibility based on what your body says. It’s fine to do some easy cross-training on non-running days, as long as the activity doesn’t make your muscles sore or increase the potential for injury. If you don’t want to exercise on days you don’t run, that’s okay, too. Has running taken time away from your favorite book or that newly-released TV show on Netflix? Now that you’re logging fewer miles it’s time to play catch-up! If you plan to cross-train it won’t hurt to go for an easy ride on a stationary bike. Read while you pedal. Catch a couple of episodes of that new show. The distraction from that book or the show will also help distract you from taper madness and the fact that you’re running less. Increase your foam rolling! Make sure your body is in tip-top shape for race day. Work out all those kinks. Keep your muscles feeling good. If you need to, see a massage therapist. As long as you have access to some products, foam rolling can be done practically anywhere. The benefits are immediate. Have some extra time in the morning before leaving for work? Foam roll. Free time at lunch? Foam roll. Catching up on that TV show? Foam roll. You get the idea! This may be the best thing you can do for yourself at this time. Experts recommend sleeping eight to nine hours per night. To start, choose a consistent time that you are in bed, this may or may not include actual sleep. This will signal to your body that rest is important and hopefully lead to more shut-eye. Instead of focusing on trying to get a good night sleep the night before, try for two nights before. Pre-race jitters can sometimes leave us with the “I am not even sure if I slept at all” feeling the night before. Don’t let this bother you. One poor night’s sleep shouldn’t affect your performance if you have tapered well in other aspects. Skip the pizza and beer for now. Focus on a diet that balances moderate carbohydrates from whole food sources, quality protein, and healthy fat. You may also want to keep a close eye on your calorie intake. While you are used to high-intensity training and the extra food that comes with it, you still have to watch what you eat. The pounds you knocked off can sneak back on in these last weeks, which is less than optimal for race day. Avoid eating that can affect your sleep quality. This includes eating large meals within 90 minutes of going to bed, spicy foods, or large amounts of protein. Now is also a good time to make sure you are well-hydrated. It is recommended to drink 8-10 glasses of water a day. You can also add electrolytes from nuun, to get your body ready for race day hydration. Hydrate with what will be on course, Mango Orange nuun performance. You can also try the on-course fuel with Gatorade Endurance gels. By starting now, you are setting yourself up to be ready race morning. The last advice we have is to arrive at least 90 minutes before the start. Walk or jog around as a light warmup. Then follow the Camp Gladiator trainers as they lead a pre-race warm-up at 6:45 a.m. at the start line. 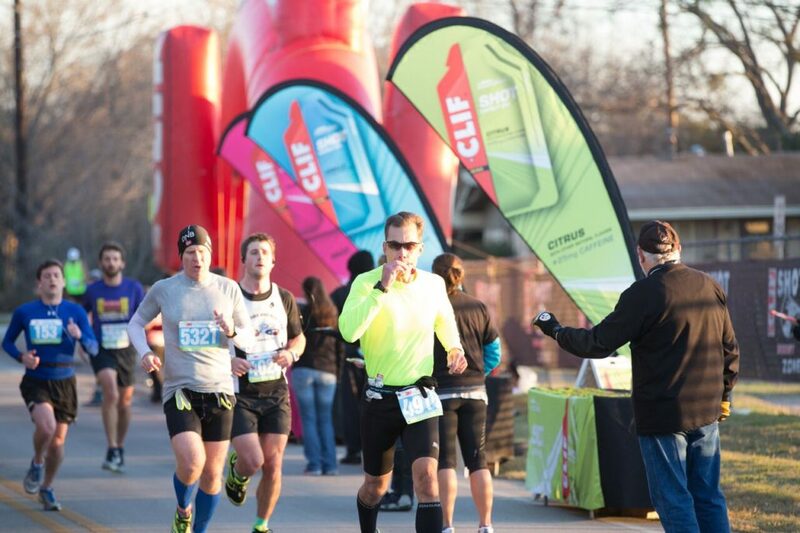 High Five Events announces Clif Bar & Company will return as the Official Sports Nutrition for the 2018 Austin Marathon. The sponsorship will provide participants with the fuel needed to have a successful race and create enhanced race-day activations for participants and spectators alike. 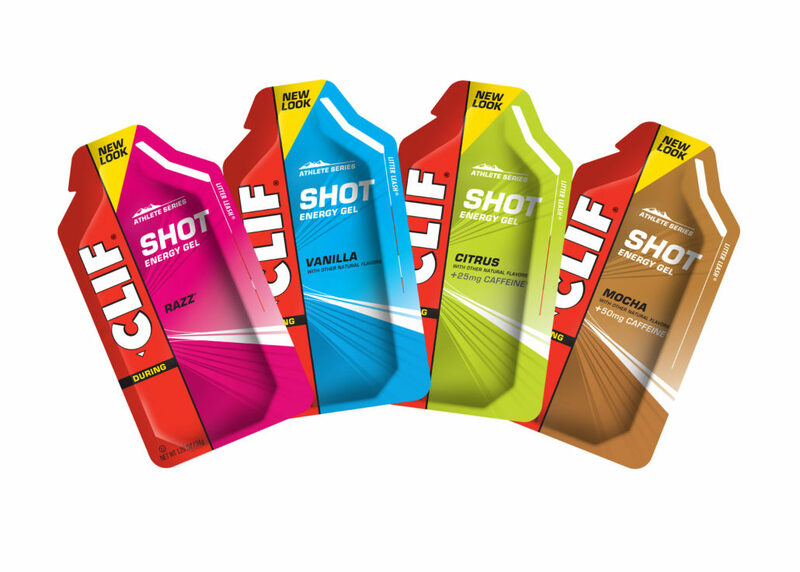 Runners can look for CLIF SHOT® Energy Gel on course at the two different CLIF® Energy Zones and other products at the finish line. Flavors include: Mocha, Citrus, Razz, and Vanilla. Participants can sample the newest CLIF Nut Butter Filled Energy Bars at the Health & Fitness Expo prior to race day. New flavors include Banana Chocolate Peanut Butter, Caramel Chocolate Peanut Butter, or Blueberry Almond Butter. In addition, the Austin Marathon and Clif Bar will increase community engagement and product awareness by offering free samples to training clubs, sampling product at running stores, supporting various demo runs around Austin, and hosting the 2nd Annual Austin Marathon Happy Hour. The Austin Marathon will celebrate its 27th year running in the capital of Texas on February 18, 2018. Austin’s flagship running event annually attracts runners from all 50 states and 20+ countries around the world. Having start and finish locations just a few blocks apart, being within walking distance of many downtown hotels and restaurants, and finishing in front of the picturesque Texas State Capitol makes the Austin Marathon the perfect running weekend destination. Participants can register for the marathon, half marathon, or 5K. High Five Events (owners of Austin Marathon) is a participant in the Amazon Services LLC Associates Program, an affiliate advertising program designed to provide a means for sites to earn advertising fees by advertising and linking to amazon.com at no additional cost to the user. Expo Highlights You Don’t Want to Miss!